Demonstrating 28 exciting styles in step-by-step detail, the Art of Nails provides a unique opportunity for professional nail technicians, trainers and aspiring students to enjoy an impressive exhibition of the technical expertise and workmanship of nail art at its best. In The Art of Nails, Jacqui Jefford presents five cutting-edge collections. Demonstrating 28 exciting styles in step-by-step detail, she provides a remarkable blend of glamour and inspiration invaluable to anyone who shares Jacqui’s passion for nails. Styles range from fashion to fancy dress and all showcase stunning photography. Expert and clear explanations make her incredible work accessible to all nail art practitioners. 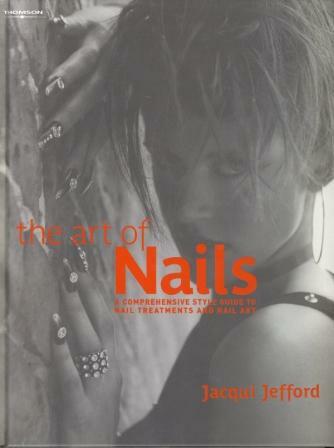 Jacqui Jefford has now held her position of professional excellence within the nail industry for over twenty years. Jacqui is widely renowned as a nail art authority, her work recognised as pioneering and her style and creativity highly sought after by an extensive A-list clientele. The Art of Nails provides a unique opportunity for professional nail technicians, trainers and aspiring students to enjoy an impressive exhibition of the technical expertise and workmanship of nail art at its best.